Speeding through residential neighborhoods is one of the most frequent complaints issued to police departments. It can also be one of the greatest barriers to surmount when parents consider whether to allow their children to walk or bike to school. Speed is a major factor in whether or not a pedestrian/vehicle collision proves fatal. Children and seniors are often more vulnerable to fatal injuries. A 10-mile per hour increase in speed, from 20 to 30 mph, increases the risk of death for a pedestrian in a collision nine-fold. If a car traveling 20 mph hits a person, there is a 95 percent chance that the person will survive; if that same car is traveling 40 mph, the chances for survival are reduced to 15 percent. Speeding can be addressed in three main ways; through policy, driver education or roadway improvements. Many communities have Transportation Safety Committees already in place that can investigate policy and infrastructure changes and recommend actions to local government. These municipal or school district-based committees typically include representatives from the police department and local government, engineers, neighborhood residents, school officials and other interested parties. If your municipality has no committee, contact your Traffic Safety Officer to find out how best to report speeding issues. Many policy changes can be made to enhance safety. For example, requests for more aggressive enforcement of speeding and other moving violations, particularly during rush hours and school travel periods, can be made directly to police departments or through local governmental councils or wards. Additionally, police can control signals manually at major intersections during morning and afternoon school travel times and rush hours. This can greatly improve pedestrian safety as it forces drivers to stop at crossings rather than speed through. Municipal budgets are tight so it is important to work with police to target enforcement in specific problem areas. In Bergen County, for example, the local Keep Kids Alive Drive 25 chapter reaches out continuously to the community, both through the media and by delivering programs and events for county residents. In October 2007, the organization held a fall kick-off event at Van Saun Park in Paramus, featuring guest speakers, government officials and activities highlighting pedestrian safety issues facing the county. The highlight of the event was the appearance of Tom Everson, executive director of the national Keep Kids Alive Drive 25®, who spoke about the origins of the initiative in Omaha, Nebraska, his hometown. Other notable appearances included Bergen County Sherriff Leo McGuire and Bergen County Police Chiefs Association President William Corcoran, both of whom pledged the county’s resources to toughen enforcement of traffic laws in residential neighborhoods. Many residents request additional signage to help reduce speeding. Increased use of stop signs and/or traffic lights work in some situations, but may be only somewhat effective as drivers often ignore signals. Permanent street signs are eventually disregarded by drivers who become used to seeing them all the time, or they get lost in the clutter when many signs occupy the same space. Deployment of permanent or temporary “Your Speed” radar-enabled signs, such as those found in EZ-Pass toll lanes, can be a more effective way to get drivers to watch their speed. The City of Garfield installed permanent feedback signs at eight public schools and one parochial school in 2005. 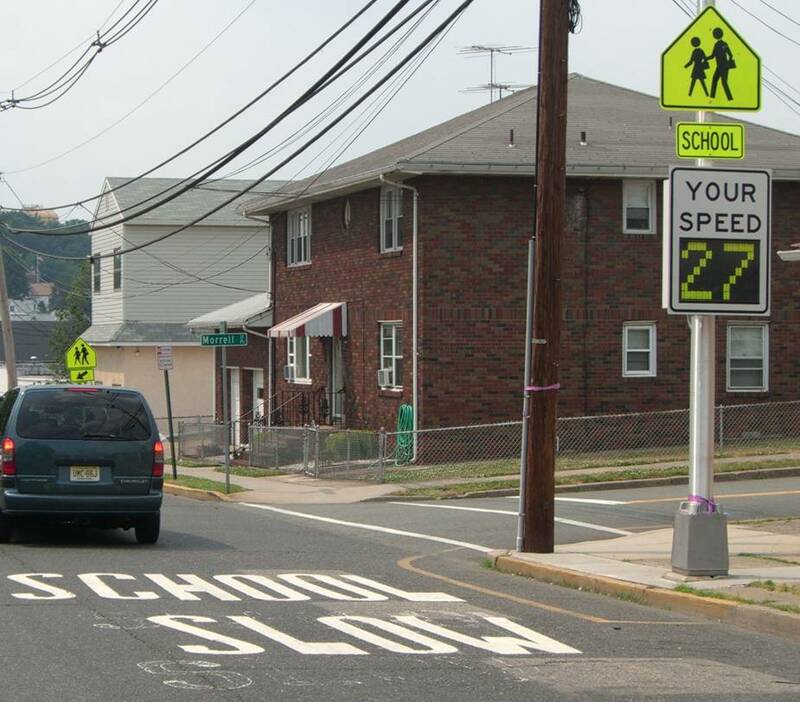 In Burlington County, permanent “Your Speed” signs near schools are turned on by school administrators during school hours and left off on evenings and weekends. Evaluation is an ongoing process involving monitoring outcomes and documenting trends through data collection both before and after your speed control program has been implemented. These pre- and post-intervention speed studies will help to determine if the speed control program has been effective in reducing speed and what changes may be necessary for the program to expand and remain successful into the future. Even with all of these strategies, it is important to continually reinforce the message about the need to slow down. Any campaign to reduce speeds should be reinvigorated every few months by reminding all motorists of the importance of slowing down. We all can play a role in this effort—starting with slowing down ourselves. This entry was posted in Education, Enforcement. Bookmark the permalink.